THE LOAD ANGEL RANGE OF FALL PREVENTION AND MAINTENANCE PLATFORMS offer solutions when working at height eg. during the loading and un loading of vehicles, securing loads, lashing loads, sheeting loads, as a mobile work platform or to use in conjunction with flat bed trailers, curtain side trailers or any other type of trailer/artic. 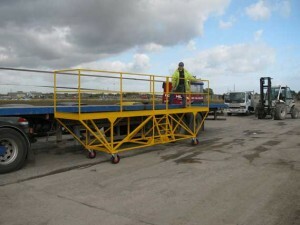 Also these loading platforms offer a fall protection solution and refuge whilst performing maintenance tasks on vehicles or heavy plant. According to figures published by the HSE ( In their ‘Falls from Vehicles Campaign’), 60 people working in haulage and distribution were killed last year and another 23,000 suffered injury severe enough to keep them off work for three or more days. The HSE says the deaths were caused by four kinds of accident – most often during loading, unloading and maintenance work. These include falls from vehicles with most causing injury being from a height of only two metres or less. Falls in the road haulage industry caused 299 major injuries in the 2006/07 work year including one fatality. Over two thirds of these falls were from vehicles. 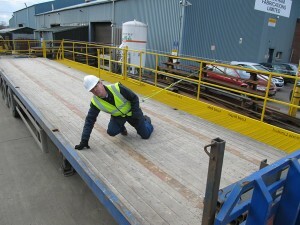 Fortunately, if you’ve been looking for some form of portable/temporary access platform or portable/temporary working platform, then Grantham Fabrications has within its fall protection system a range of portable work platforms that have been specifically designed to address problems associated with vehicle maintenance, loading and unloading to give total edge protection. All platforms are manufactured within the guidelines of BS5395-1:2010 Stairs/Ladders/Walkways and the open steel flooring used for the floor to BS 4592 part 1 (2006) and is rated to general duty regular two way pedestrian traffic 5.0KN/m2. If you do not see what you require please ask as we are sure we can offer a solution. For a quotation or further details of this product please contact Chris Clarke or George Holt on 01476 577037 or email info@loadangel.co. Registered in England No. 1617935. 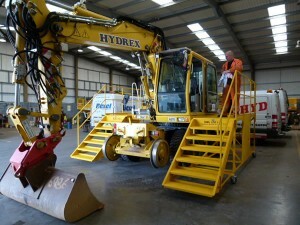 Registered Office: Grantham Fabrications & Profile Services Ltd, Venture Way, Grantham, Lincs. NG31 7XS. UK. Load Angel is a Registered Trademark of Grantham Fabrications & Profile Services Ltd. No. 2540673 - 2nd March 2010.